What is “Let the Good Grow”? 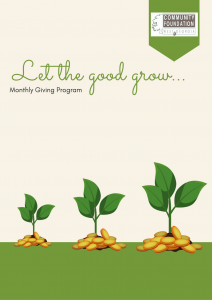 Let the Good Grow is a monthly giving program that will allow people to make a difference in Carroll, Heard and Haralson counties forever. It is an initiative introduced by the Community Foundation of West Georgia to encourage donors to pledge a monthly contribution. The contribution can be either $20, $50, $100 or more each month and it will join with many other donations. These donations then become many thousands of dollars for grants that will enhance the quality of life for thousands of people in these three counties. Each month your donation goes directly into the Foundation’s Community Impact Fund, which distributes annual grants to local organizations supporting: human service, arts and culture, environmental, economic development, education, medical and hospice programs. Monthly donations can truly change the world around us with an impact that lasts a lifetime because this endowed fund continuously grows and gives back to the community forever. Please choose your monthly recurring giving amount below. If you would like to give more than $100 monthly please call our office. By accepting these terms, you authorize the Community Foundation of West Georgia (CFWG) to automatically withdraw the amount selected above from the specified bank account on a monthly basis until you discontinue the deduction. If sufficient funds are not available at the time the withdrawal is attempted, you authorize CFWG to submit the withdrawal for payment a second time and agree that all associated bank overdraft or other bank fees are solely your responsibility. You may discontinue your participation in the monthly giving program at any time. To discontinue your participation in the program and stop the monthly withdrawals you must notify CFWG in writing. Please note that it may take up to 30 days after the CFWG receives your written request to stop the automatic withdrawals. Yes, I agree to all terms set forth by the Community Foundation of West Georgia, and wish to be enrolled in the Monthly Giving Program.